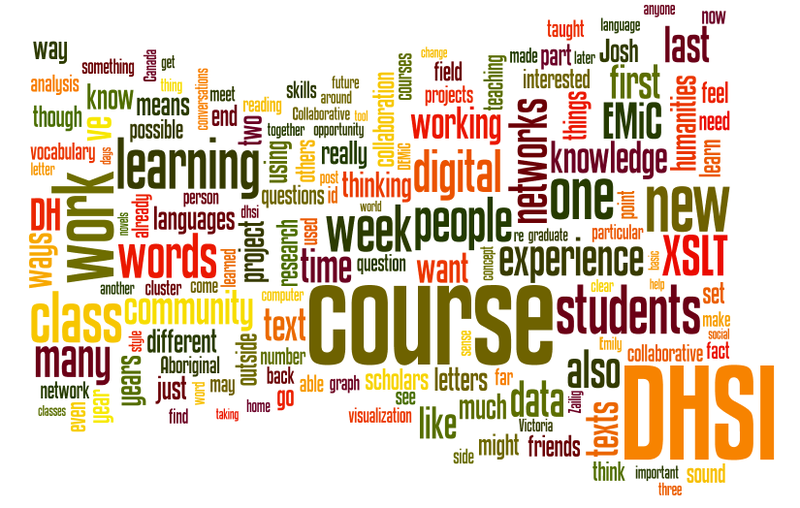 This word cloud was created by submitting all of the EMiC blog posts about DHSI 2014 to a program that generates a visualization of the most commonly used words and phrases. Words that encourage working together, such as “community,” “cluster,” “collaborative,” “together,” and “social,” are a prominent theme in the cloud, with “Future Around Collaborative” acting as a fitting subtitle to the central words “Learning Course DHSI.” I also enjoy how the cloud arrangement created the term “Working Digital People.” Hopefully DHSI 2014 left everyone feeling like well-oiled working digital (humanities) people. 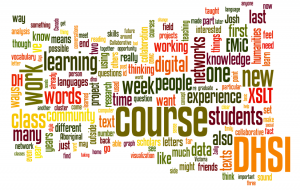 The blog certainly indicates that everyone is feeling better equipped to create and motivated to co-create with others. Please keep sharing– the blog activity has been excellent these past ten days and the posts are encouraging and stimulating. Thanks to everyone for keeping the conversation going!